SARIOLA is a female fronted Extreme Dark Metal band with Gothic echoes from Duisburg in Germany. Band was founded in 2005 and released “The Sphere Of Thousand Sunsets” in 2006, “Deathfrozen Silence” in 2009 and single “From the dismal Sariola” out in 12th September 2014. 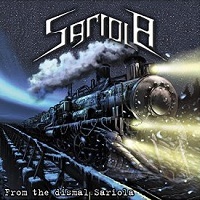 Sinlge track “From The Dismal Sariola” is full of heavy riffs and great rhythmic section. Massive sounds and pulp of drums with echoes of keys togeher with female vocalist sounds interesting. Track has also dark climate and progressive change rate. Pathethic refrain with symphonic singing too. Totall chaos is in this track, but i mean in positive meaning. Melodic „Siren in seven mirrors” with massive drums, symphonic keys and progressive influences sounds really good. Also opera vocal is so interesting together with Death Metal climate in the background. I like the most „Hexshadowed”where machine drums in FEAR FACTORY style together with heavy guitars and gentle keys create fantastic dark climate. SARIOLA play mix Extreme Dark Metal with Gothic and Symphonic influences. This all give unique and modern sound to this band! They could be recognise on music market very good in the future. I am keeping my fingers crossed for their career! Recommend to fans of female fronted bands with power.